Want to get connected? Fill out the form and I promise we will be! Hello darlings! I wanted to share my favorite summer piece-culottes. 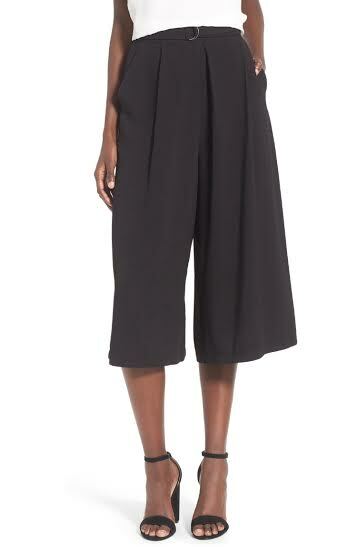 My skin type (and wardrobe) are not built for hot summer weather so culottes are perfect for those who have really pale skin and still want something comfortable and lightweight. This total throwback piece is making a comeback and I'm obsessed! I was a little hesitant at first, but once I found the perfect pair-I never take them off! My closet is filled with blacks, blues and grays which is why I decided to share this black pair, but I did find some cute colored linen culottes which are great for those who like a more colorful wardrobe. I paired my culottes with a simple black bodysuit (both on sale now!!!) and my new favorite tassel sandals. Enjoy!